The history of bridges in the Fargo area is only half the tale. Much like neighbors deciding how to split the cost of labor and materials on a fence, the city of Moorhead had just as much invested into bridge building as Fargo did. Needless to say, the meetings between Fargo and Moorhead officials got heated at times. The back and forth went from petty accusations to downright grudge matches, but in the end it all worked out and after ten years there were two bridges connecting the twin cities. This is just the beginning of a very long history on the subject. Soon after the completion of the first bridge, the Northern Pacific Bridge in 1872, a wooden bridge was built that allowed people to cross the river on foot and by wagon. The cost was split between Fargo and Moorhead, and they soon realized it was very expensive to maintain. Laborers had to be paid to remove the bridge in the early spring before the ice began to flow and damaged the pylons supporting the bridge. They also had to pay for maintaining and replacing the rotted and broken pieces of wood damaged by steamboats, weather, and bridge traffic. The biggest issue concerning cost was the dismantling of the bridge due to steamboats delivering materials and goods up and down river. Because the wooden bridge was so low to the water, steamboat crews or laborers had to be paid to completely remove the bridge to let the steamboats pass. Depending on how long the steamboat would be, the bridge would have to be replaced as soon as possible to allow for traffic to cross, only to be disassembled again when the steamboat arrived. The bridge also had to be dismantled every spring before the large chunks of ice began to flow. In May of 1877 the ice flow was very fast and it tore the bridge apart. John Mason, pioneer and businessman, rebuilt the bridge for the last time. This maintenance and dismantling of the wooden bridge took place from 1875 to 1881. When maintenance stopped on the wooden bridge, a temporary pontoon bridge was put in its place while the sister cities began serious talks about building a permanent bridge across the Red River. Both sides could not agree on the site so they compromised and decided to build two bridges, one off of Front Street and the other off of Northern Pacific Avenue. 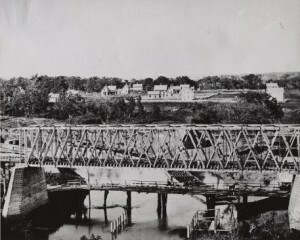 In 1883, the Front Street Bridge was completed. In the same year, Clay County built a bridge off of Eighth and Ninth Streets. 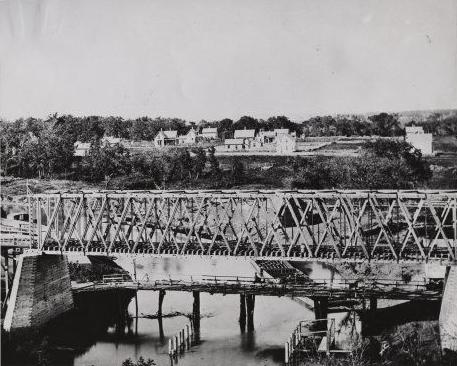 It was two years later, in 1885, that the second bridge was finished on NP Avenue. By no means is this the complete story of bridges in the Fargo area. The study of bridges in the Fargo has a very long history still waiting to be told. “Bridges,” Finding Aid, Fargo, N.D. Council Meeting Minutes, 1875-1910, IRS-NDSU.